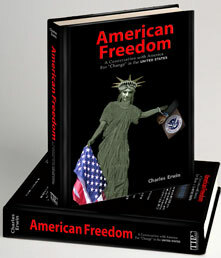 Charles Erwin’s non-fiction book exposes the secret government of the UNITED STATES and the forces behind the secret government which are taking away our Constitutional Freedoms. This publication is "THE" Reference Book to Freedom every Patriotic American Citizen has been waiting to be written. During a time when Congress violates the original Constitution with nearly every bill it enacts, this book contains the constitutionally lawful recipe to break the cycle and restore our Freedom. Secret forces within the UNITED STATES have been working to enslave America for more than 100 years. It is time the American people fought back! Each chapter exposes in detail the legal and unlawful laws used by the majority of our governmental representatives to enslave the American people…WITHOUT OUR KNOWLEDGE OR CONSENT. Knowledge being Power, once the people of the “Real” United States know the specifics behind the legal tactics being used by certain representatives of the “Fictitious” UNITED STATES, the restoration of our Freedoms will be under OUR lawful constitutional control. American Freedom A Conversation with America For “Change” in the UNITED STATES is a unique publication. The multi-colored printed Reference Book can be used as a color-coded indexed resource manual, providing valuable information American Patriots need to restore the Sovereignty and Freedom of the American people. In eBook format, our three color indexed resource manual is a powerful searchable PDF (Portable Document Format) file allowing the user to find information in an instant. The eBook format additionally supplies volumes of source and reference material from the Internet to your computer with a mouse click. To our knowledge, American Freedom is the only publication chronicling this massive amount of freedom information in one Reference Book.